We love to hear from our customers and truly value your opinion. Do you have a suggestion or comment? Click here to leave feedback. I have only made one other wedding cake 10 years ago. So this is the cake I made for my sons wedding Saturday. The girls at the store helped me with so many questions and it went great. Thank you so much. I found out about your store from the web-site Cake Central. Members there raved about your company and I had to find out for myself. I love your store. The customer service is over and beyond. You must have magic dust to get the shipment here so fast! I have been ordering with your company for a few months now and am very pleased with every part of your company. Everyone has been very friendly and helpful. Congratulations to you and your employees! It is a pleasure everytime I have called. I will continue to spread the word about you and look forward to doing business with you in the future. G.M. I just wanted to thank you for the super quick service and excellent packaging of my order! You guys are great and one of these days, I'll visit your store in person; (have to have some money first, though I'll be like a kid in a candy shop LOL). It's so nice to have such a great cake supply company right here in Indiana. Thanks again! I received my order yesterday- speedy! CK Creme Bouquet is the ABSOLUTE BEST emulsion flavoring I've ever used! Everyone I know raves about the flavoring in my baked goods! Thank you so much! You have a new returning customer. J.H. I wanted to thank you for shipping this so fast. I was amazed to see my order placed late Tuesday, delivered on Friday. Everything is as always, in perfect condition. I will recommend your store to everyone. I received my first order with Country Kitchen and wanted to let you know how pleased I am with your service. The speed with which you go the order out was unbelieveable and the packaging was wonderful. I have ordered from several other companies, but none can compare with you. You now have a new steady customer! C.S. I'm very impressed with your website. I received your email newsletter, starting poking around on the site and ran across something i've thought vendors should always do- list a project idea complete with recipe, ingredients list and links to puchase info for the list. Thanks for making it so easy. J.M. I just wanted to thank you for not only being affordable, but for being dependable. You've made my business run so smoothly just knowing that when I order something from you, it's as good as gold. K.B. I placed an order yesterday morning, and in typical Country Kitchen customer service it was on my front porch today. It amazes me how wonderful your service is. I never have to worry about things getting here too late for the procrastinator in me. I have ordered many times and will be ordering again soon. P.S. Love the website. So easy to click and order. J.G. I just wanted to pass along that I am so happy with your service. I had been moaning about high shipping rates for cake boxes and a friend referred me to you. Other places were charging more for shipping than the boxes cost! I am extremely pleased! YOU ROCK! Thank you very much for my order. You were so kind to spend the time on the phone with me to help me find the products I needed. Additionally, you ensured my product shipped the same day and arrived the very next. Thank you! C.B. I emailed your website and my positive experience to over a dozen friends. You guys have great customer service and all the products I need. A.L. CKSA thanks for all of your help on the cookies and healthy smash cake for my son's 1st Birthday Party! 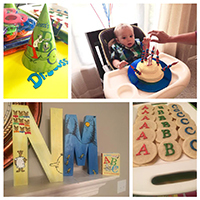 Dr. Seuss themed ABC party!